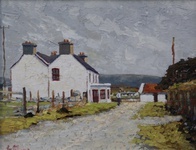 Grey Day at Deserted Village - 54cm. x 44cm. By the Stream, Dooagh - 30.5cm. x 25.5cm. 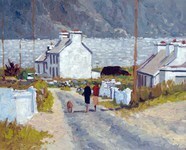 Fiona, Grainne and Brendt the Dog, Achill 1995 - 51cm. x 40.5cm. 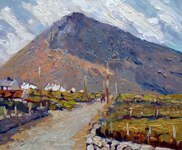 Slievemore in Full Light - 42.5cm. x 32.5cm. 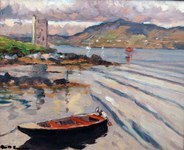 Granuaile’s Tower - 27cm. x 22.5cm. 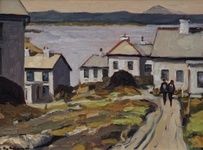 “On My Way to Keem Bay" - 40cm. 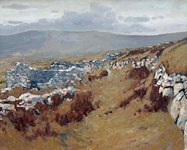 x 40cm. 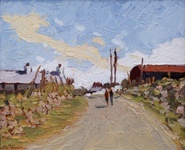 Dookinella Road - 40cm. x 26cm. 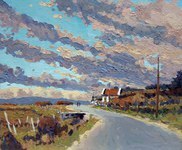 On the Way to the Golden Strand 57.5cm. x 47.5cm. 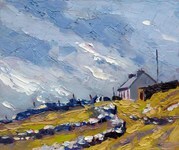 “On My Way to Achill Beg” - 30.5cm. x 25.5cm. 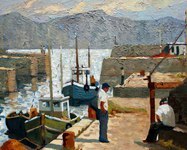 Purteen Harbour - 57cm. x 46.5cm. 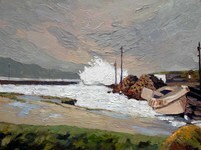 Storm at Purteen 2014 - 61cm. 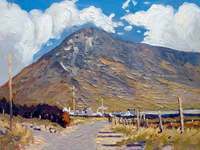 x 46cm.